One of America's leading Impressionist painters, Mary Cassatt spent most of her life living in Europe, and trained in Paris. In the 1870s she came under the influence of French Impressionism, learning a good deal about drawing from the great figurative artist Edgar Degas in the process. She exhibited at the Impressionist exhibitions of 1877, 1880, 1881 and 1886, but remained relatively unrecognized back in America until much later. Cassatt's specialty was painting women and children, particularly the intimate bond between them. Her images are still extremely popular and frequently reproduced as art posters. Her best known paintings include Young Woman Sewing (1886, Musee d'Orsay); Girl Arranging Her Hair (1886, National Gallery of Art, Washington); Baby's First Caress (1890, pastel, New Britain Museum of American Art) and Two Children at the Seashore (1884, National Gallery of Art, Washington). Other Impressionist works include: Self-Portrait (1878, Metropolitan Museum), The Long Gloves (1889, Private Collection) and Summertime (c.1894, Armand Hammer Museum of Art and Culture). In Paris, Cassatt influenced American collectors, in particular the wealthy Havemeyers, whose outstanding collection of 19th century modern art was eventually donated to the Metropolitan Museum of Art. In 1910, Cassatt was elected a member of the US National Academy of Design. Other exponents of American Impressionism, include: the pioneer Whistler (18341903), William Merritt Chase (1849-1916), Theodore Robinson (1852-96), John Singer Sargent (1856-1925), Childe Hassam (1859-1935), John H Twachtman (1853-1902), and J. Alden Weir (1852-1919). Cassatt was born in Allegheny City in 1845, which is now part of Pittsburgh. The family circumstances were fortunate: her father was a wealthy stockbroker and her mother came from a banking family. Travel, as part of a rounded education was encouraged, and Cassatt spent five early years in Europe, visiting Paris, Berlin and London. In Europe she received her first lessons in etching and music and, at the Paris World Fair of 1855, was exposed to painting masters such as Delacroix, Ingres, Courbet and Corot. The later Impressionists Edgar Degas and Camille Pissarro were also at the Fair, both of whom would become influential friends in later years. Returning to America, Cassatt began studying painting at the Fine Arts in Philadelphia when she was 15. She continued her studies during the American Civil War. Fellow students at the time included the realist painter, photographer and sculptor Thomas Eakins (1844-1916), who would later become Director of the Academy. Frustrated at the limitations set on female students - women were not allowed to use life models (until years later), and were required to practice drawing by copying casts - Cassatt decided to study the Old Masters herself. In 1866 she quit the Academy without an Arts Degree, and moved to Paris. Travelling to Paris with her mother, Cassatt planned to continue her studies in whatever way she could. As women were not eligible to enroll at the Ecole des Beaux-Arts, she settled for private tutorials from masters of the school. She was accepted as a student of Jean-Leon Gerome (1825-1904), a French painter, teacher of academic art. His range of subjects included historical painting, Orientalism, Greek mythology, and portraits. He also taught Eakins a few months later, when the young artist was in Paris. Cassatt also studied by copying the Masters in the Louvre. As young ladies of society were not to be seen in the cafes where artists socialised, the museums formed an alternative gathering place. It was here that Cassatt met and befriended fellow female artist Elizabeth Jane Gardner (1837-1922), who became the first woman to exhibit at the Paris Salon, and who incidentally married the famous academic painter William-Adolphe Bouguereau. In 1866 Cassatt joined a painting class taught by the painter and engraver Charles Joshua Chaplin (18251891). Chaplin conducted art classes specifically for women in his studio. In addition to Cassatt, he also taught the English artist Louise Jopling. Cassatt also studied with the artist Thomas Couture (1815-1879), an influential French history painter who also taught Edouard Manet, John La Farge, Henri Fantin-Latour and Pierre Puvis de Chavannes. On trips to the countryside with her class, Cassatt made genre studies of peasants and children going about their daily lives. In 1868, one of Cassatt's paintings, A Mandolin Player (private collection), was selected for the first time for the Paris Salon. It is romantic in style, and shows a young girl playing a mandolin, in the manner of Courbet. In fact, it is only one of two paintings that remain from the first decade of her art career. While Paris was fermenting with new artistic ideas - the Impressionists were breaking with traditional academic styles - Cassatt stayed within the remit of Academic art, submitting works to the Salon with increasing frustration for the next 10 years. During the 1870 Franco Prussian War, Cassatt returned briefly to America and lived with her parents. While continuing to study, she tried, without much success to sell her paintings in a New York Gallery. Despairing of ever making a living, she was tempted to give up on her art career. Then, in 1872, she attracted the attention of the Archbishop of Pittsburgh who paid for her to travel to Italy and copy two paintings by the Renaissance painter Antonio Correggio (1490-1534). Overwhelmed with joy, Cassatt headed back to Europe. After completing her commission in Italy for the Archbishop, Cassatt travelled to Spain where she painted numerous Spanish themes, including Spanish Dancer Wearing a Lace Mantilla (1873, Smithsonian Institute). In 1874 she moved to France where she remained, except for brief trips home, for the rest of her life. Over the next few years she submitted several works to the Salon, but was continuously rejected. In 1877 she met Edgar Degas, who invited her to exhibit with the Impressionists as an alternative. The Impressionists rejected traditional subject matter and painterly techniques, and adopted the practice of plein air painting, using vibrant colours and expressive brush strokes which were mixed by the eye, rather than pre-mixed by the artist. (For more, see: Characteristics of Impressionist Painting 1870-1910.) The Impressionists had been receiving mixed reviews for years, but their radical opinions made a strong impression on Cassatt, changing her life in the process. Berthe Morisot, another female Impressionist became one of Cassatt's closest friends. 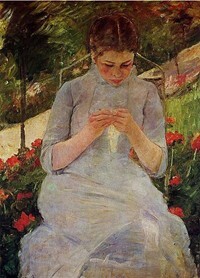 Cassatt hoped for commercial success by adopting the avant-garde techniques of Impressionism, painting the sophisticated Parisians in the district. Her style gained a new spontaneity over the next few years. She would go on to exhibit with the Impressionists again in 1880, 1881 and 1886 (the year that fellow American Impressionist Childe Hassam arrived in Paris). Degas also introduced Cassatt to pastels and etching, the two often worked side by side and her drawing skills improved considerably under his watchful eye. For more details, see: Impressionist Painting Developments. For details of specific pictures, see: Best Impressionist Paintings. Cassatt was an important player in the financial support of many of the Impressionists. She bought Impressionist paintings herself and encouraged many wealthy Americans to do the same, most notably the Havemyeyers, who bought a significant number of the major Impressionist works (including those by Monet and Degas) which now hang in the Metropolitan Museum of Art. She also loaned money to the art dealer Paul Durand-Ruel (1831-1922), whose support of artists like Claude Monet (1840-1926), Camille Pissarro (1830-1903), Renoir (1841-1919), Manet and Degas was critical. After 1886, Cassatt started exhibiting her works in New York, but with little success. It was not until after her death in 1926 that her paintings gained popularity in her homeland. Today she is one of America's most popular female artists. After 1886, Cassatt no longer identified herself with the Impressionist movement and experimented with a variety of styles. In recognition of her contribution to arts, Cassatt was awarded the Legion of Honour in 1904 and became a member of the National Academy of Design in New York in 1910. The last two decades of Cassatt's life were her most commercially successful. She focused primarily on mother and children themes, and these remain her most enduring works. A prime example at the Metropolitan Museum of Art is Mother and Child (c.1899). She is also seen as something of a pioneer of feminist art for her mural on the subject of Modern Woman (1893) which she painted for the World's Columbian Exposition in Chicago. She also made a series of highly original, coloured dry point and aquatint prints (influenced by Japanese prints). The Smithsonian Institution notes that these coloured prints, "now stand as her most original contribution adding a new chapter to the history of graphic arts as technically they have never been surpassed." Very few of Cassatt's mother and child paintings actually show related people, she preferred to select models and match physical types to achieve her desired results. In 1912 the artist became partially blind, and by the time she died, she was completely blind. 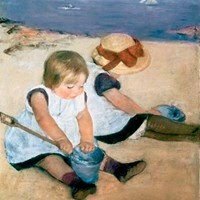 Today, Cassatt's paintings can be seen in the best art museums across America - such as the Smithsonian American Art Museum, Washington DC - and in the Musee d'Orsay in Paris, France.  For more biographies of Impressionist artists, see: Famous Painters.  For more information about modern art in America, see: Homepage.